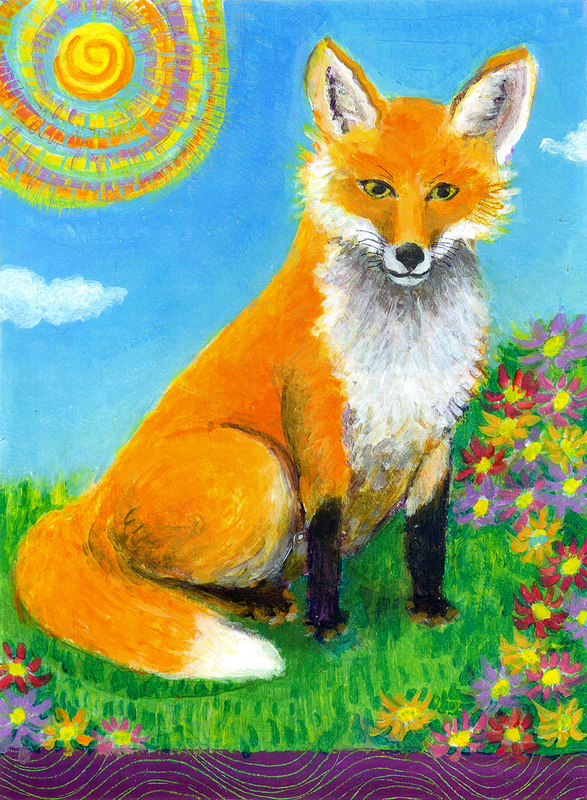 I have just completed Fox on the Hillside for my Heni’s Happy Painting’s Etsy Shop. It is the third in a series of animal paintings done in the same style that I’ve made for a baby’s nursery or young child’s bedroom. The idea for painting a fox came to me on my recent trip to Asheville which brought back memories. Years ago I had lived about twenty miles south of Asheville in an old farmhouse up a country mountain road. I worked for a landscape architect in town. I remember that he was very kind to me and that I got lots of practice doing working drawings for the various government projects he had. I enjoyed living in the farmhouse; it was a beautiful area and the neighbors were very kind and helpful. There were cows in the neighbors pasture which was above the farmhouse. As you walked up behind the home and past the pasture, it got steeper and become a forested mountainous area which turned into the Pisguth National Forest. One day around dusk I went outside to play my guitar on a large rock just up from the house. After a while I got the feeling that someone was watching me. I glanced up the hillside and there was a fox sitting on a rock looking and listening to me. It was a beautiful creature, it stayed for a bit longer and then scampered back up into the mountains. It’s one of those moments you don’t forget. This painting is little tribute to that fox that was listening to me that evening.